Landscape Postcards – the inspiration! Here are a pile of the resulting squares which I cut out of all that lot! Here’s the whole lot! 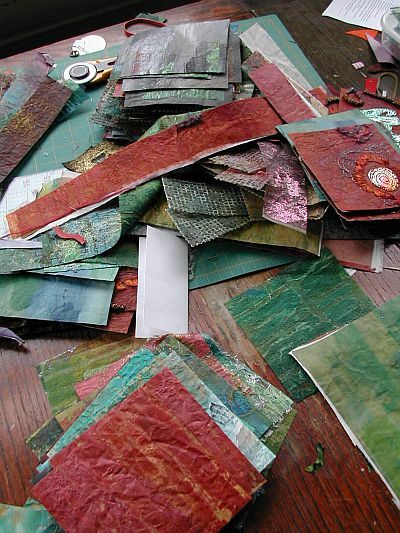 I cut lots of thinner rectangles from the offcuts which will be added into the mix…. These all look like they are going to be great fun to work with. Can’t wait to see what you do with them. I love pictures of work tables… this is a really fun shot. So much potential! I’m loving the results too. Previous PostPrevious More sticking and painting! Hello. My name's Liz Plummer and I'm an artist based in Newport, South Wales, UK, I love dyeing, printing, painting and stitching. This blog is about the influences on my work, inspiration, my daily life, and the processes of creating. Enjoy! Where to buy your Printables? 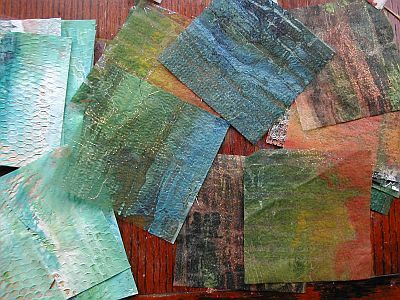 For a FREE sample pack of printable painted papers, sign up for my newsletter today!